I’ve hunted deer with the same group of more than a dozen friends for the past 25 years, and every season it seems more youngsters join us. They usually get one of Dad’s “other rifles.” Eric’s girls both started with his .22-250. Another Vermont friend started his youngsters at age 8 with a single-shot .223, which he now sometimes packs himself. Wally, who owns a .270, a .30-30, and a .35 Remington, does all of his tree-stand hunting with a .22-250. I’ve yet to hear of a deer hit in the vitals with any of these “varmint rounds” doing anything but falling on the spot or within a few yards. I grew up thinking that a centerfire .22 would be a weak choice for deer, as my favorite woods rifle back then was a Remington pump in .35 Whelen. I’ve had to rethink that a bit, though I’m still not completely sold on the idea of using an explosive .224 varmint bullet for deer. It just doesn’t equate as a tough-enough bullet for the shoulder of a game animal that may top 200 pounds. While my friends have been successful using traditionally explosive varmint bullets, I used two Barnes TSX bullets and one Nosler Partition to take three deer with my own .223. All were hit behind the shoulder, and the bullets exited all three. The Partition broke a rib going in, and one of the X bullets broke ribs entering and exiting. All three deer dropped on the spot. But all I hear are success stories with the varmint bullets, and I hear a lot of them. If you just look at it on paper, the numbers say that a bumblebee shouldn’t be able to fly, either. It seems that a highly explosive 55-grain varmint bullet hitting at 3,200 feet a second (or more) does deliver enough shock to devastate a deer’s nervous system. If you question the effectiveness of shock, look at Berger Bullets big-game line, including 7mm and .30, which are designed to get 2 inches inside the animal and then deliberately come apart. I have no doubt the folks at Berger know what they’re doing. Still, I recommend (and handload for several friends) a sturdier .224 bullet for deer. The 60-grain Nosler Partition .224 is just such a bullet. Partitions have been around since the 1950s, in factory ammo since the 1970s. The unique jacket is built in the form of a letter H, with lead cores in the front and back. Mushrooming stops at the partition. While it does, at times, lose most of its nose lead, it does not blow up. Federal and Black Hills offer Partitions in factory .223 and .22-250 cartridges. With bonded bullets, the jacket is bonded to the core, and these promise to lose no more than 10 percent of their lead nose as they expand and penetrate. Remington offers a 62-grain and Winchester a 64-grain bonded .224 bullet load. 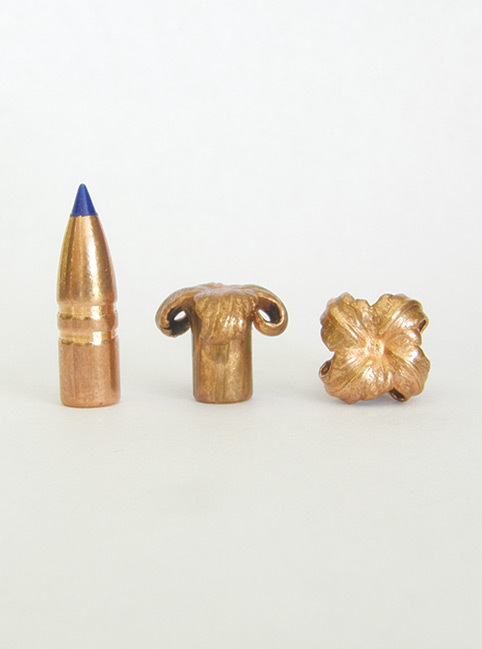 Monolithic bullets were invented by Barnes Bullets owner Randy Brooks back in 1989. Barnes all-copper hollow points always mushroom perfectly and do not lose any weight. When you’re shooting a bullet that you think may be on the light side, it’s nice to know it is going to retain all of its weight. Randy improved the original “X” with circular groves in the body, calling these Triple Shock X or TSX. Next, he added a plastic tip atop many, making the Tipped TSX, or TTSX. Barnes offers six monolithic bullets in .224, including 45- and 50-grain universal bullets, 53- and 55-grain bullets requiring a 1:12 or faster rifling twist, a 62 requiring 1:9, and a 70-grain requiring 1:8 twist. The idea of fast-twist rifling to stabilize heavy-for-caliber bullets is catching on, but be aware that the faster-twist rifles often don’t shoot lighter 40- or 50-grain bullets very well. Hornady now has its own monolithic, called the Gilding Metal X or GMX. They sell a 50-grain .224 bullet and also offer it in factory .223 ammo. Nosler also makes a monolithic, which they call E-Tip, but they don’t make it in .224. Winchester’s website specifically recommends three .223 loads for whitetail, all using 64-grain bullets: a Power Core monolithic, a Power Max bonded, and one conventional jacketed bullet. They also recommend their “Razorback XT” in .223 for wild boar, shooting a 64-grain monolithic bullet. If it’s OK for a 400-pound hog, it must be OK for a whitetail. Federal offers a .223 load using Nosler’s 60-grain Partition. They list several .223 loadings under their varmint category, but this Partition load appears in the big-game category. Remington offers two excellent .223 loads, a 62-grain Core-Lokt Ultra Bonded and a “Hog Hammer” load using a 62-grain Barnes TSX. I’m not quite ready to go with the .223 exclusively, but at 70 years of age, I need a light deer rifle and prefer one with little recoil. I usually carry a 5-1/2-pound Savage rifle in .243, shooting monolithic Barnes TTSX 80-grain bullets at about 3,200 ft/s. I’d rather shoot a 90- or a 100-grain bullet, but monolithics of that weight, being all copper, would be too long to stabilize with the rifling in my .243. Besides, every 80-grain bullet thus far has exited the deer, from my .243 and also my wife’s 6mm JDJ#2. And every deer has dropped, though no one can promise that will always happen. The .270 Winchester shooting a 150-grain bullet has long been considered an adequate elk cartridge, and an elk may weigh 750 pounds, roughly five times the size of a typical 150-pound whitetail buck. Do the math, and you come up with 30 grains as an equivalent acceptable bullet weight for deer. That’s a bit of a stretch because there’s not much momentum in a 30-grain bullet. But it does say something about why 50-grain .224 monolithic bullets are proving to be effective. With the ever-increasing popularity of AR-style rifles for deer, I feel I should address differences between the two most common rounds and also the rifles that shoot them. The 5.56x45 was developed in 1957 as a military cartridge. Remington quickly brought out a civilian version and called it the .223, though it actually held a .224 diameter bullet. Outwardly, the 5.56 and .223 are virtually identical, and for the most part, either cartridge will fit and fire in either rifle. However, certain combinations are not advisable. Here’s my take on the situation, starting with the rifles. When a rifle fires, two initial resistances must be overcome as the bullet starts moving in the chamber. One is the inertia of the bullet while the other is the engraving of that bullet by the rifling in the bore. These resistances are not great, but pressure rises a bit more if they occur at the exact same instant. As little as a few thousandths of an inch of freebore in the chamber (room for the bullet to move before contacting the rifling) ensures they don’t. More freebore also allows for a smidgen more powder, which yields a smidgen higher muzzle velocity. The 5.56 cartridge has that smidgen more powder, and the rifle chamber has considerably more freebore to keep pressures acceptable. The chamber is also roomier for more reliable chambering in a full-auto military rifle. Civilian .223 loads tend to be just a smidgen lighter, and the rifles usually have tighter chambers with minimal freebore for better accuracy. The ability to minimize loose chamber fit and also freebore with a custom loading are the main reasons handloaders can almost always improve the accuracy of a given rifle. Because military and civilian folks use very different methods for determining maximum safe pressure, simply comparing pressure numbers is not all that revealing. But the bottom line is don’t shoot 5.56 ammo in .223 chambers. No doubt, millions of military 5.56 rounds have been fired in commercial .223s, apparently with few issues. But facts are facts, and military ammo could put excessive stress on the wrong .223 action. So, again, don’t shoot 5.56 ammo in .223 chambers. Shooting .223 cartridges in 5.56 chambers is safe, but the loose fit and extra freebore can hurt accuracy. If a rifle is stamped .223/5.56, it should have enough freebore to safely handle 5.56 ammo and still shoot .223 loads accurately enough for hunting, certainly for deer. Load a bullet designed for big game, and you should be fine. Another growing trend in .223 rifles is that faster rifling twist to stabilize longer, heavier bullets for long-range competitions and now hunting. Barnes makes heavy hunting bullets and CorBon offers a load using a 62-grain Barnes, but most of the extra-heavy-bullet ammo uses target bullets that are not designed for use on game. Again, use one of the hunting bullets, and you should be OK. Just be aware that these longer bullets may tumble when fired from a barrel with “normal” rifling, and this can definitely hurt accuracy.